Designed by Stefan Antoni, world-renowned, Capetonian architect, MOONDANCE villa has opened for exclusive-use bookings after the villa has been revamped and updated to the highest international standards by the Berman Brothers Group. 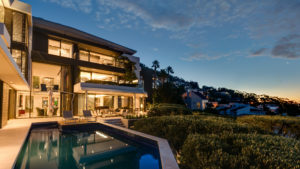 Located at the foothills of Lions Head in the most exclusive part of wind-free Fresnaye (Cape Town), the exquisite, multi-levelled architectural masterpiece sleeps 8 guests, celebrity-style, and offers complete privacy complete with all modern conveniences and panoramic seascapes across the Atlantic Ocean and Robben Island. Set in a premier location, the villa is available for exclusive-use private rentals, small weddings, launches and functions. Peak season rates are R130 000 per night, whilst low season rates are available from R65 000 per night – inclusive of Butler service, full breakfast and stocked bars on check-in. With bold, dramatic architectural features that include a statement staircase and private lift above an indoor water feature, the villa is decorated with the finest finishes and top quality furniture throughout. The open-plan design of the living and entertainment areas inter-connects several lounges, bar areas, the dining room and living rooms on the ground floor – leading to spacious terraces with BBQ areas, water features and Koi ponds, as well as a rim-flow swimming pool. Decorated with contemporary South African art, the villa boasts an under-pool bar, in addition to a Smart Lounge and a Cinema Room. The villa is home to the largest private gym on the Atlantic seaboard, professionally equipped with an on-site steam room and Technogym equipment. Four en-suite bedrooms are luxuriously finished to the highest of standards, including a magnificent master suite of 260m², with walk-in closets, a private lounge and kitchenette. A manicured, verdant secret garden showcases a formal olive grove of 60-year old olive trees, lining a magical and secluded entertainment space paved in traditional Cape Dutch Klompie clay bricks to present the perfect setting for a champagne brunch celebration or a fairy-lit, outdoor dinner party.